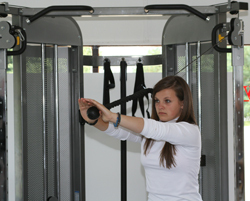 The most versatile multi-functional trainer on the market – ideal for personal training gyms or home environments. Two weight stack trainer allows full functionality, bi-laterally; exercising each limb independently but at the same time. The weaker limb cannot be compensated by the stronger limb. This encourages better core positioning and better balanced strength training. Designed for executing standing, seated, Swiss ball, kneeling, lying or bench exercises. Easily allows for a full body workout. Swivel pulleys allow 360degree workout movements. Full hi-low adjustability with 19 possible positions on each upright section. A full set of attachments including, lateral pull-down bar, short bar, ankle strap and rope attachments are supplied with the DAP SG. The DAP comes in a sleek silver grey finish, with sleek weight shrouds to rival the very best on the gym floor. Your exercise workouts with this DAP SG are only limited by your own imagination! Sold brand new – £1550.00 including VAT, delivery and installation.